As you complete your animation project, you can update a job's status to reflect where it is in the overall production process. You can classify jobs as being In Production or Completed. • In Production: The Job is still a work in progress. The other modules can still access this Job. • Completed: The Job is finished. The Harmony database still has all the job's components (scenes, elements, drawings), but the job neither appears nor is accessible from the Harmony applications. In most cases, you would mark a Job as Completed after it has been finalized (inked, painted, rendered) and transferred to a medium like tape or sent to post-production. You can change a job's status from Completed to In Production at any time to continue working on it. 1. In the Environments section, select an environment. 2. In the top menu, select Job > Change Stage or you can also right-click in the Jobs section and select Change Stage. The Change Stage of Jobs window appears. 3. Select the jobs you want to change the stage. ‣ If you want to change a job from In Production to Completed, select the jobs in the In Production list. ‣ If you want to change a job from Completed to In Production, select the jobs in the Completed list. 4. Click one of the Change buttons to change the job's status. ‣ Click the Change to Completed button to change a job that is in production. 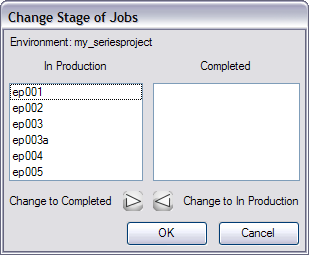 ‣ Click the Change to In Production button to change a job that is completed. 5. Click on the OK button when you finish making changes.